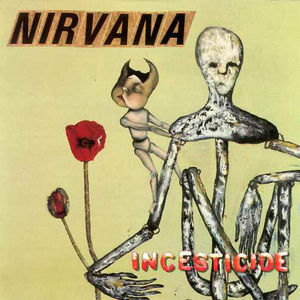 Incesticide is a compilation album by the American grunge band Nirvana. Incesticide consists of demos, outtakes, and radio broadcast recordings. At the time, all of the material on Incesticide was circulating within fan communities (albeit in lower quality). It was widely reported in the music press that the band wanted to offer fans a higher-quality alternative, but in the book Cobain Unseen, Charles R. Cross reveals that Kurt Cobain agreed to the release of this compilation because he was allowed complete control over the album's artwork. The album was released on December 14, 1992 in Europe, and December 15, 1992 in the U.S. Incesticide debuted at fifty-one and eventually reached number thirty-nine on the Billboard 200.